Follow Dr. Bonine on this forensic exercise into hidden infections with the help of his new Cone Beam digital imaging device. You can watch the Cone Beam video or read the story below. "Could you image that your overall health is affected by what is going on in your mouth? Imagine that you have a tooth with a hidden infection that can’t be found. Maybe it’s affecting your sinuses. Maybe it's setting you up for heart disease, stroke, or diabetes. These are all examples of what we look for when we try to find hidden infections in the oral cavity. But how do we find them? The dental CT scan gives us an overview image proving us with a three dimensional representation of the area that we are invested in studying. 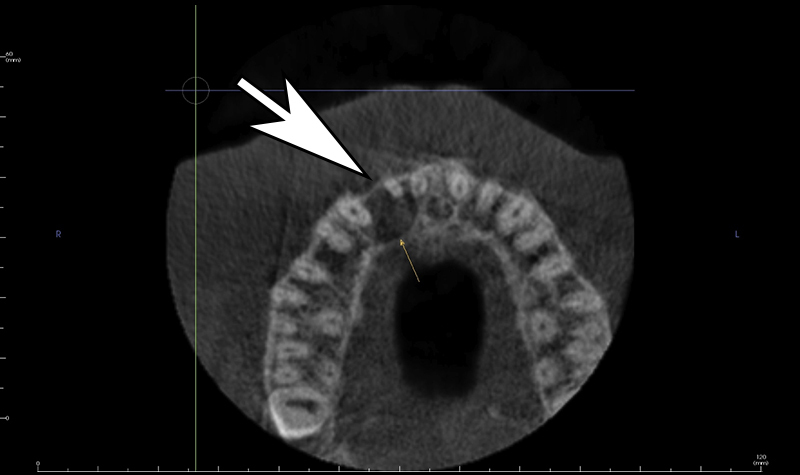 With the 3-D, we can rotate the image on screen to the area or the tooth that concerns us and look at it more critically. 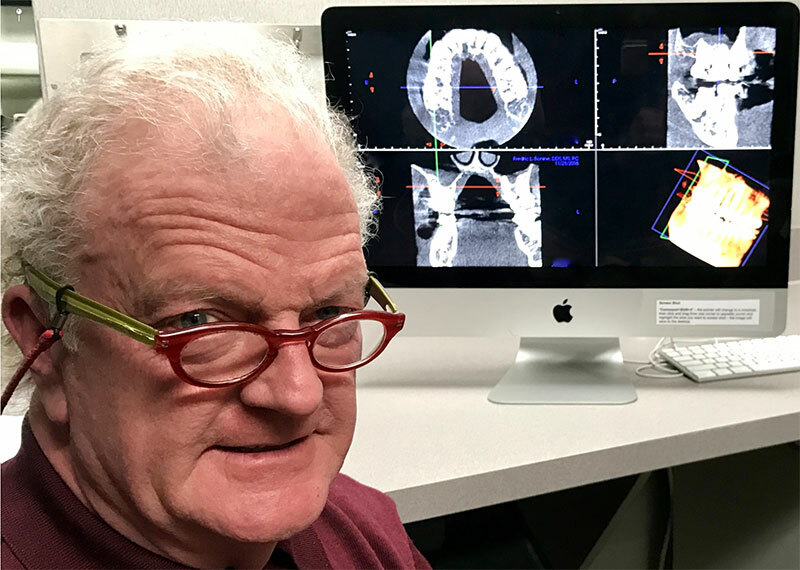 By moving the 3-D image back and forth and by changing the angle of the plane, we can very carefully review the anatomy at the tip of a tooth that we are concerned about. 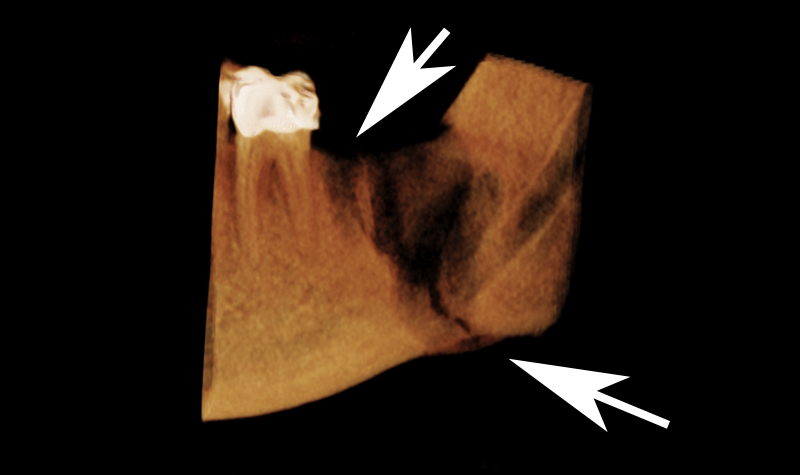 In this particular case, we are able to notice that there is destruction of bone from an infection around a previously treated tooth that has extended up into the sinus. And the concern down below was that a tooth that had also been previously treated had subsequently cracked and we can see and evaluate the amount of bone structure here. Traditional dental x-rays would not have allowed us to visualize this and to be able to make this diagnosis. And we are getting a tremendous bang for the buck here to be able to pick up on a couple of different areas both with problems that we would otherwise not see. This technology is so illuminating on past mysteries. Solving problems sooner getting better general health through oral health." Happy Groundhog Day from Dr. Bonine and Staff! Dr. Bonine and staff wishes you a Merry Christmas and Happy Holidays! 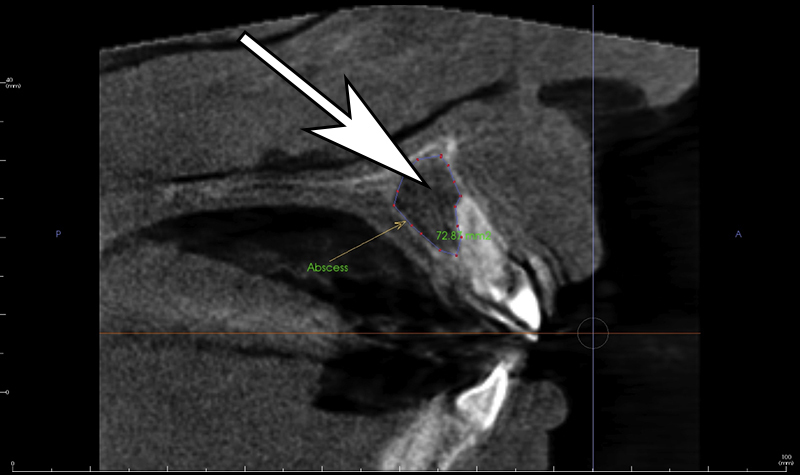 Our new updated radiograph machine is also capable of taking a CBCT, a small field cone beam. What is that? An ultra high resolution CAT scan enabling a 3D evaluation of sight specific areas. Instrumentarium is an industry leader in highest resolution, improving diagnosis, and improving predictability. It allows low radiation and economical practicality. 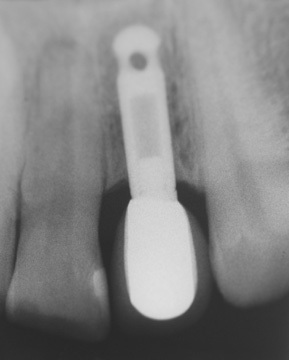 We have been able to detect a low grade, non-symptomatic infection on an adjacent tooth next to an implant. This could lead to the implants failure. 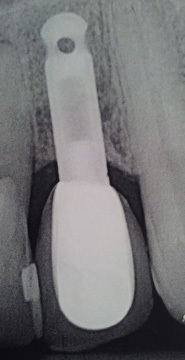 In this case, the scan was forwarded to the endodontic specialist to have the area treated. Patient that came in for a consult for wisdom teeth, a cyst was found in the front of her mouth needing further follow up. Who doesn’t love their front teeth? They affect your smile, eating, and facial configuration, which all affect our self esteem. So if you lose one, replacing it is essential! This Implant was placed on a front tooth in 1990 and 26 years later is still going strong. This patient moved from the area but when her new dentist was passing through the area, stopped in the office with a current x-ray to report how beautiful and stable it still is. Now that’s something to smile about! Had this been a bridge there would have been a 10% chance of loosing the adjacent teeth for each decade. The average life of a bridge is only 10 years, meaning it would likely have been replaced 2 times by now. With inflation, that means a $20,000 investment, not to mention time and the possible loss of the adjacent teeth. Multiple myeloma is a cancer that forms in a plasma cell. Plasma cells help fight infection. Bone problems are one of the complications of multiple myeloma, which can lead to bone pain, thinning bones and broken bones, including the jaw bone. 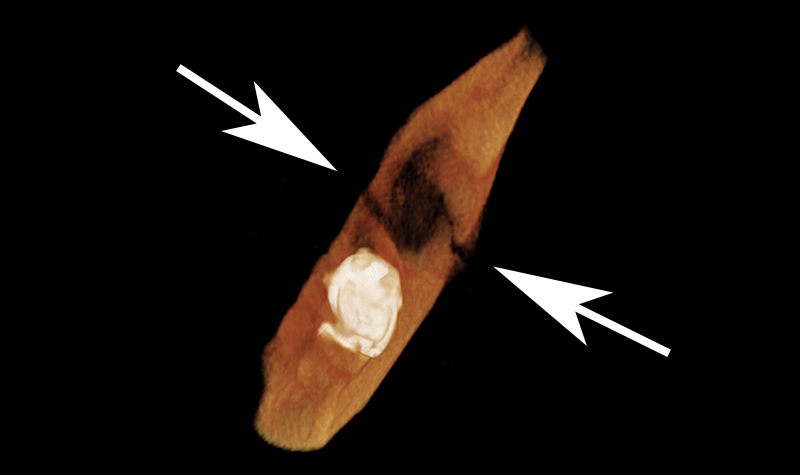 This is just another example of what can be detected in a dental x-ray. Here is an example of a patient that came in for a consultation for implants who received an x-ray to find a life threatening condition. 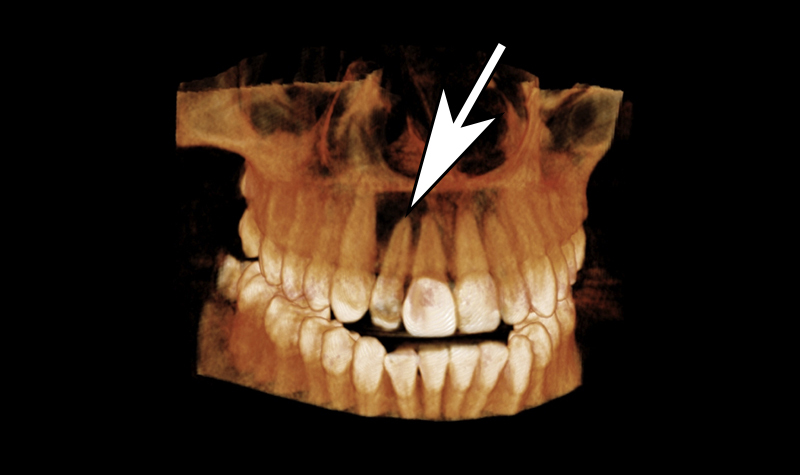 Notice the bubbly appearance in the bottom jaw bone and the resorption of the roots of the teeth. Dr. Bonine referred her back to her physician for further testing with a concern of multiple myeloma. The patient is currently undergoing chemotherapy. Dr. Bonine and his entire staff hold Advanced Cardiac Life Support certifications. They are equipped and prepared to deal with an emergency, should once occur at the office. The Gold for Food fundraiser is a program started by Dr. Bonine wherein donated scrap dental gold from patient's old crowns and restorations are processed at a refinery and the proceeds are donated to Gleaners Food Bank in Livingston County. The program has been running for 19 years and has contributed to over 600,000 meals for the hungry in our community. The 2014 Gold for Food program raised $8645 in donated gold which was then doubled by sponsors. A total of $17,290 was donated in 2014 to Gleaner's Food Bank as a part of the Gold for Food program! On October 15th, 2014 from 3:00pm - 8:00pm, Dr. Bonine Oral & Maxillofacial Surgery, along with Oaken Transformations Sculpture & Poetry Walk, invites you to celebrate Dr. Bonine's 30th year of practice with an open house featuring live music, refreshments, and tours of the office and art walk. This event is open to past and current patients and colleagues of Dr. Bonine, as well as the general public. Dr. Bonine received a certificate of appreciation from Livingston Gleaners Community Food Bank. 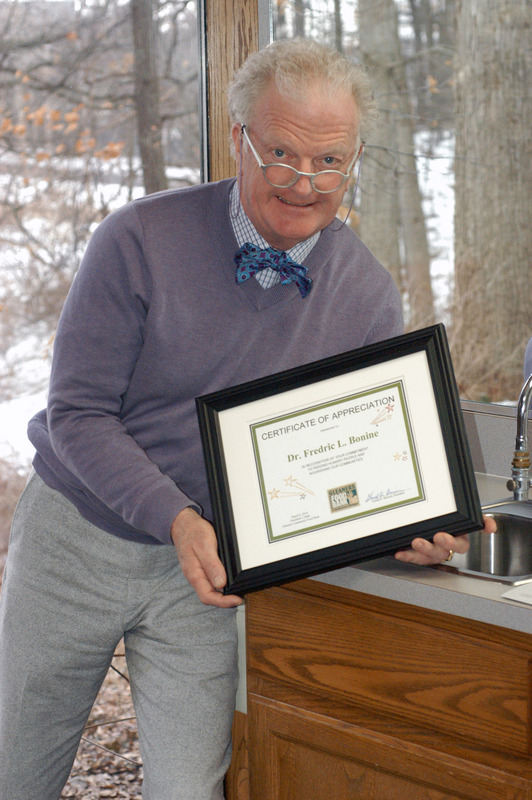 Dr. Bonine created the Gold for Food program in 18 years ago; since then he has helped Livingston County raise a total of over $192,498 to benefit Gleaner's Food Bank. Did you know that the Canadian government recommends 2000 IU of Vitamin D to be taken daily? Dr. Bonine firmly believes in the myriad health benefits of Vitamin D. Often when a patient is not healing fast enough after a procedure here, Dr. Bonine will recommend testing for Vitamin D levels. There is evidence of increased tooth loss and risks of oral cancer from low Vitamin D levels, whereas good levels of Vitamin D in the body reduce the risk of breast, colon, and prostate cancers. Vitamin D also appears to boost spirits, cure fibromyalgia, be anti-inflammatory and an immune system booster. How Green is Dr. Bonine's Office? We have an organic beekeeper who tends a small community of bees on the back portion of our property because we don't use harmful pesticides on the land surrounding our office. On top of that, we do all of our day-to-day parking lot and sidewalk maintenance, and only use environmentally friendly Urea and solar methods to help melt the ice. That means less chemical residue tracked into the office. We also have a recycling program that's about three years old, and recycle everything from ink cartridges to batteries to paper. Dr. Bonine is a firm believer in preventive healthcare. He doesn't agree with the traditional "nickel-dime" method, which has many docs charging patients for each time they set foot in their offices. Sometimes it may cost more up front to come here for a medical procedure like a biopsy, but Dr. Bonine rarely (if at all) charges for follow up care. That means that should you need close, long-term follow up appointments to monitor a situation, most often you don't get charged each time you come to the office. 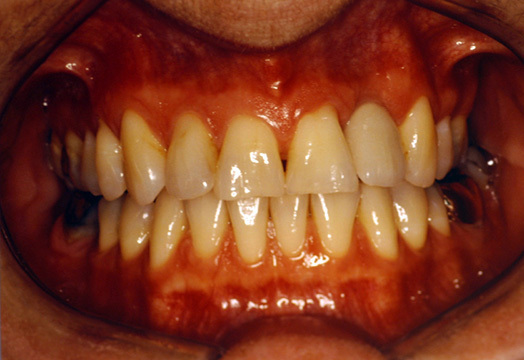 Pre-cancerous lesions may be followed indefinitely in this manner. Gold for Food raised $17,243 this year! Gold for Food raised $17,243 this year! 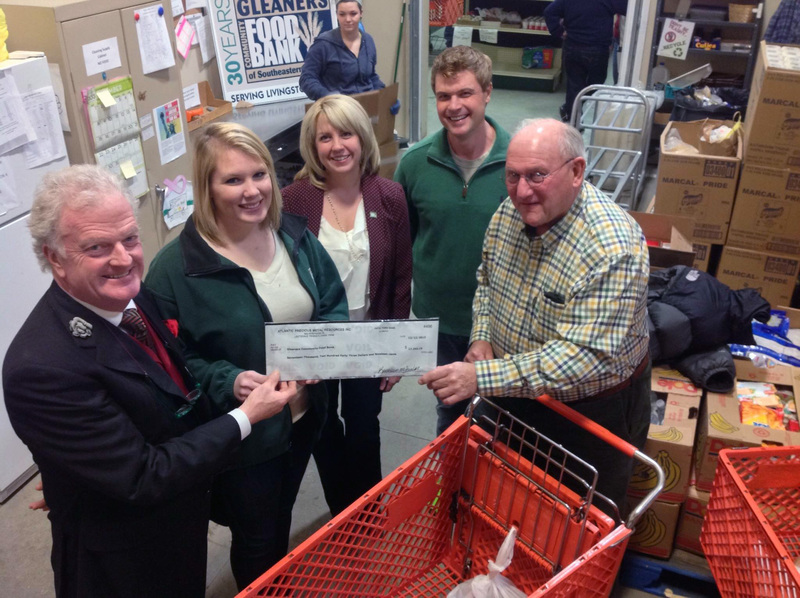 Dr. Bonine, Dr. Metz and Dr. Rondeau presented the check to Bridget and Tracy of Gleaners Community Food Bank December 16, 2013. It will be matched dollar for dollar by Gleaner's board members! Way to go Livingston County!! PEERRS is a web-based foundational instruction and certification program for the members of the University of Michigan community engaged in or associated with research. Dr. Bonine is currently involved in two research studies where he is serving as an Investigator. When you choose to send patients to our office for management, you will be comforted with the knowledge that we take the seriousness of anesthesia to heart. We recently participated in our annual ACLS training, and we are proud to announce that all of our senior surgical clinical staff are Advanced Cardiac Life Support certified. Our team is prepared to help your patients have the safest anesthetic experience possible. "Another phenomenal experience with Dr. Fred Bonine. Dylan had extensive oral surgery yesterday and he was privileged to have Dr. Bonine perform the surgery. His staff was incredible with Dylan, the surgical experience was very positive and better yet, today he has no pain! Thanks a ton."